Around 200 colleges are expect to be hit with strike action today (February 24), as members of the University College Union (UCU) and Unison walk out in an ongoing dispute with the Association of Colleges (Aoc) over pay. The unions estimate that thousands of staff, including lecturers, librarians, technicians, cleaners and caretakers, will be striking in protest at a recommended pay freeze by the national employers’ organisation AoC. However, FE Week has spoken to a number of colleges who said they were not aware of any classes being cancelled as a result of the strike. Meanwhile, the AoC has said it has no plans to go back to the negotiating table. Dave Prentis, Unison general secretary, will be joining the picket line outside City and Islington College at 9am this morning. He said: “The real villains in this dispute are government ministers, whose funding cuts over several years have left colleges in dire financial straits. “But it shouldn’t be further education employees paying the price. “After years of pay freezes and real terms pay cuts, staff have been left with no choice but to take action to win a fair deal. Today’s joint action, which follows a walk out in November by UCU members, comes after a ballot last month in which two thirds (65.7 per cent) of Unison members who voted backed strike action. The vote was in response to a zero per cent pay offer for 2015/16 made by the AoC over the summer. A ballot of UCU members in October resulted in 74 per cent of those who voted (4,184) backing industrial action. Sally Hunt, UCU general secretary, will be addressing a rally at the Emmanuel Centre in London from 1.15pm, alongside shadow business secretary Angela Eagle. Ms Hunt said: “A pay freeze is an insult to the commitment and enthusiasm of staff working in further education, and fails to address the real-terms pay cut they have suffered in recent years. Marc Whitworth, the AoC’s director of employment policy and services, said: “Strikes are very disruptive for colleges and more importantly for students. “The pay recommendation of zero per cent made by the Association of Colleges reflects the specific financial challenges faced by our members. UCU has around 20,000 members in around 200 colleges affected by the strike, a spokesperson said. Not all colleges will be taking part as some have reached local pay deals, the spokesperson said. Unison has around 25,000 members in FE colleges. 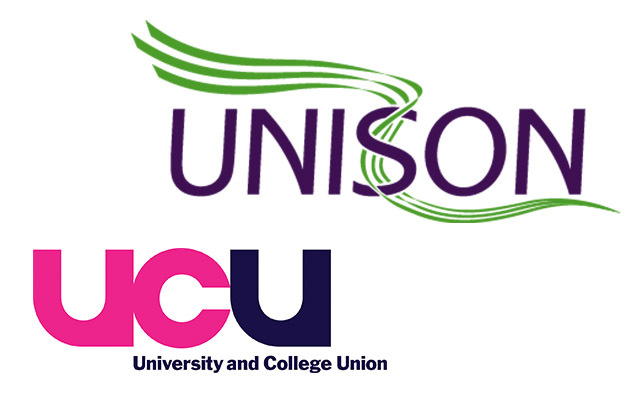 Unison members will be taking action in around 170 colleges, a spokesperson said. Calling a national strike for FE Colleges is pointless.There are essentially only two reasons why calling a strike should ever be recognised as a reasonable or potentially-productive course of action. UCU do not, at present, tick either box. This has been the case in every strike they have supported in the past decade or so. 1. The inconvenience industrial-action causes the general public: this is what strikes are supposed to do: as unpopular as they typically are, by a group of workers withdrawing their labour, it is supposed to create unrest and upset which serves to emphasise the importance of what the workers do. For instance, when London Underground go on strike, the unions are aware of the considerable public inconvenience it creates. The same goes for when school teachers threaten to strike: the burdens can be felt in many ways. Most of us remember the chaos fire-fighters created some years back when they threatened strike actions. For school-teachers, parents often have to take time off from work themselves; spend money on childcare; help children progress with the work they’ve missed etc. However, For FE Staff, the inconvenience by lecturers and support-staff striking is minimal and arguably creates none whatsoever. Even if FE staff went on strike for a month, it would struggle to get coverage in local newspapers, let alone the national press. See, as the majority of the learners within FE are over 16, it is merely regarded as a ‘day off’ for them. When the lecturer returns to work, more often than not, they’ll end up having to cover the materials they missed on ‘strike day’ and having lost a day’s pay (or more) for their troubles, the whole ordeal proved pointless and, as the last strike proved, got next to no coverage in the press anyway. Indeed, if the general public have no idea why staff are striking – because the message hasn’t been communicated – they’ve been poorly advised by their union. 2. Unions work proactively to get the media and general public on the workers’ sides so when a strike is announced, it is generating strong levels of support. This is essential to get things achieved. This is where UCU have failed catastrophically for years. When was the last time the tabloid media ran an article addressing (let alone criticising) the government’s continued erosion of the FE sector? Indeed, aside from The Guardian who run the occasional feature on the government’s abysmal treatment of the FE sector, months can go by without it ever getting even a mention in the national media. UCU need to work with the media and draw major attention to the importance of the further education sector and how the government are, month by month, unleashing pandemonium upon it – but, right now, they are simply not doing this, and if they feel otherwise, they are badly mistaken. I’m pretty certain the likes of The Daily Mail, The Mirror, The Express and even The Sun would be shocked by some of the things going on inside FE, including tales of staff who’ve endured years without any kind of pay-rise and continued cutback after cutback, many of which are entirely senseless and illogical. This isn’t about a few bleating public-sector workers complaining about a poor pay-deal but about an entire workforce being treated quite shockingly. The UCU need so sort themselves out.